Extraordinary ingenuity, courage and determination are shown by the engineers who build, in dangerous and difficult conditions, the lighthouses which guide and safeguard ships at sea. THE FOG SIREN at the Souter Point Lighthouse, near the entrance to the River Tyne, Co. Durham, gives one blast of four seconds every minute. In the lighthouse there are two lights, 21 feet apart. The lights have a normal visibility of 18 miles. THE lighthouse of to-day is more than a mere tower carrying a light on a lonely promontory or a wave-washed rock. 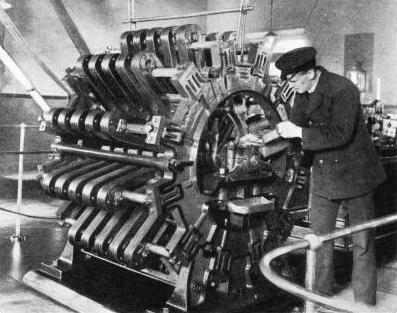 It comprises wonderful and delicate machinery and an array of intricate and scientific devices for sliding the mariner. It represents the combined skill and ingenuity of the engineer, chemist, optician, electrician and mathematician. The most magnificent of all lighthouses, the famed Pharos of Alexandria, was built long before the birth of Christ. The most remarkable of navigational safeguards, the radio beacon, which enables the mariner to know his position in thick fog, storm and rain, when the ordinary light and fog-signal cannot be seen or heard, has appeared only within the last few years. The Pharos has been described as the “father of lighthouses”, and was classed as one of the Seven Wonders of the World. This lighthouse was built by Ptolemy Philadelphus, about 260 BC, on a small island at the entrance to the harbour of Alexandria, in Egypt. It has never been surpassed by any other lighthouse in height or in fame. The structure was 400 feet square at the base and towered 450 feet in height. It was built of white marble, and is believed to have cost the equivalent of £170,000, which is the largest sum ever expended upon the building of a single lighthouse. But the signal which this magnificent tower gave to the mariner was the light and smoke from an open wood fire which, in the clearest of weather, could have been visible only a few miles out at sea. No progress was made in marine signal lights for many centuries. Little more than a century ago tallow candles were burnt in the Eddystone Lighthouse. Until 1816 the May Island Lighthouse, in Scotland, used a blazing coal fire to guide ships. Nearly all the major advances in lights - the electric lamp, the incandescent oil-vapour light, the Fresnel lens focusing the beam in the horizon of the mariner and the fast-revolving light - have been developed within little more than a century. Only in the last thirty years has so necessary an aid as the lighted buoy been used. This is a boon to the navigator who must bring his vessel into port at night through treacherous shoals and narrow channels. Right down to the time of John Smeaton, the distinguished civil engineer, who, in the eighteenth century, succeeded in placing a stone tower on the dreaded Eddystone Rocks, in the English Channel, lighthouses were nearly always built of wood. Smeaton designed the circular, dove-tailed stone tower which has been copied by lighthouse builders in all parts of the world. Smeaton’s success in building a beacon on the Eddystone Rocks gave an impetus to lighthouse building, and many stone towers sprang into existence. One of the first and one which taxed the endurance of the sea builders, was the Bell Rock Lighthouse. This was built by Robert Stevenson, the engineer grandfather of R. L. Stevenson, the author, on the famous Inchcape Reef, lying off the east coast of Scotland off the entrance to the Firth of Tay. The work of building was one long battle with the angry sea. Securing the foundations proved exceedingly difficult. Only two men could remain on the rock at a time. but they stayed there with the tenacity of leeches, the cold waters of the North Sea bearing down every few minutes and sweeping entirely over them. When the first stone was swung into position the men, ragged, chilled, and worn with the awful struggle, clung to the iron rods and cheered madly. Four years of hazardous work were spent before the tower stood complete. Then came the Skerryvore, situated on a storm-swept reef in the open Atlantic, twelve miles from the island of Tiree, off the west coast of Scotland. The Skerryvore is the highest lighthouse round the British Isles, towering 150 feet above sea-level. Operations were begun in the summer of 1838, but the tower was not completed till 1844. It. cost £82,000. The framework was put up in the course of a season, but in a great gale which occurred one night early the following winter it was entirely destroyed, nothing but a few broken and twisted iron stanchions remaining to point out its site. A second lighthouse was then built on another part of the rock. It took ten years to place a tower upon the dreaded Wolf Rock, and a longer period elapsed before the Bishop Rock was crowned with a light. These rocks lie off the Scilly Isles, in the open sea, where the English Channel meets the Atlantic. They were a terrible menace to shipping and it was desirable that they should be marked with lights. As the rocks were exposed only for a few hours at low tide, it meant a hard tussle with the angry waves. During the second season only twenty-two landings were possible on the Wolf and only about eighty-three hours’ work was put in, so terrible was the weather. Because of the narrow area of the Bishop Rook, a mere ledge measuring at low tide 153 feet in length and 52 feet in width, and descending almost sheer to a depth of 120 to 150 feet, it was decided to build an open iron tower to carry the keepers’ quarters and a light. It proved an arduous task. At last, after a stern battle lasting four years, the iron tower stood complete, awaiting its lantern. As winter had set in it was decided to wait till the following spring, and it was fortunate that this course was decided upon. In a storm that, occurred in the following February the whole structure was bowled completely over, nothing remaining but short fragments of the main columns. The dauntless sea builders, however, refused to admit defeat, and eight years later the narrow rocky ledge was crowned with a stone tower. At one time it was thought, if a promontory required a lighthouse, that the ideal place for the light way on or near its summit. The old Belle Tout Lighthouse (1831) at Beachy Head, Sussex. occupied such a position. In clear weather the light was ideally placed, and was visible far out to sea; but in thick weather it was often obscured by fogs that did not exist nearer sea-level. When the new lighthouse at Beachy Head was built in 1902, it was decided to place it at the foot of the cliff, about 170 yards from the base of the headland. 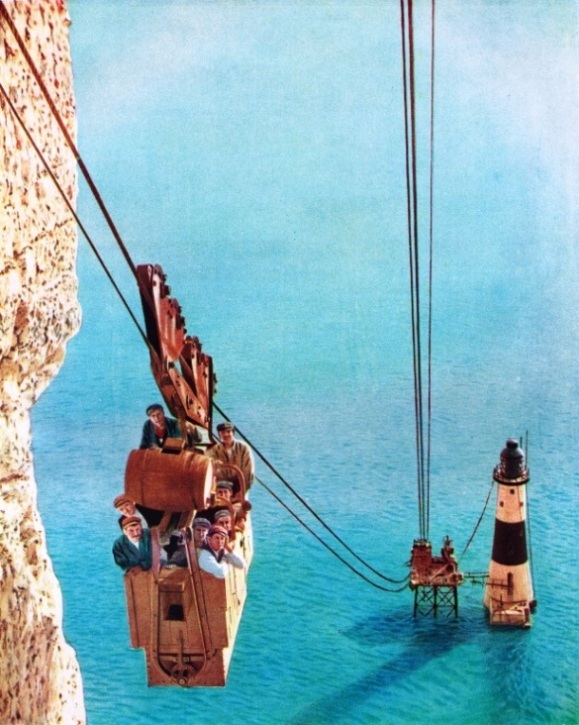 From the top of the cliff, 575 feet above the sea, men and materials were lowered by cableway to the site. The lighthouse, which has a height of 103 feet above the sea, was completed in about two years. The height of a lighthouse in areas subject to fog is determined by local conditions. Just before the war of 1914-18 a new tower was built on the Fastnet Rock, a small pinnacle off the southwest corner of Ireland. It is the last light seen by the great liners on their passage across the Atlantic. The rock on which it stands is exposed to the full fury of the Atlantic; there are few bleaker spots round the Irish coast than this formidable headland. While securing the foundations the men had to work with ropes at their sides, to which they clung when a wave broke over the rock. The work was arduous and nerve-racking in the extreme. No fewer than six years were occupied in the building of this tower, and a sum of £90,000 was spent upon it. The first unattended rock lighthouse with an automatic light and a powerful fog-signal was built upon the Platte Fougere. This is one of a series of dangerous rocks marking the entrance to Russell Channel, which leads to the Guernsey capital of St. Peter Port. Platte Fougere tower, in reinforced concrete, is of irregular octagonal shape and is 50 feet high. Its light and fog-signal are controlled from the shore by a submarine cable a mile and a half in length. On top of the tower stands the lantern, with its acetylene gas light and the trumpet of the siren. In the gallery below are an electric motor and an air-compressor. AUTOMATIC MECHANISM is often used to operate navigational lights which can thus be left unattended. Mounted on a turntable are two high-power lamps and an acetylene burner. At lighting-up time a time-switch sets a mechanism working. Should a lamp fail, a lock is released, the turntable revolves and the second lamp is locked in position. Should that fall too, the acetylene burner is automatically lighted and brought into position. Attached to the burner of the light is an ingenious clockwork mechanism which automatically extinguishes the light at dawn and ignites it at dusk, with a special arrangement to allow for the short summer nights and the long periods of darkness during the winter. A visit to the lighthouse is an eerie experience. Climbing the ladder and entering the building, one finds it apparently abandoned. Not a sound but the murmuring of the waves playing about the rocks below disturbs the silence. Suddenly, there is an almost imperceptible click. The keeper at the station on shore has moved his switch. Instantly, the silence is broken by the purring of the electric motor, followed by the ear-splitting deep-toned roar from the trumpet of the siren overhead. For illuminating expanses of coastline where the building of ordinary towers would be prohibitive because of their heavy cost - this type of lighthouse has much to commend it, and is now being widely adopted. The Platte Fougere lighthouse cost about £10,000. The cruel coast of Brittany, with its innumerable dangerous islets exposed to the full fury of the Atlantic, has been the scene of many heroic battles between the French sea builders and the pitiless sea. One of their conquests here was the placing of a magnificent tower, 118 feet high, upon a rock, known as La Jument, off the island of Ushant. There was a seven years' hard fight against almost overwhelming odds. The rock is completely covered at high tide, and projects only four feet at low water. To make matters worse, the current rushes round the reef at the rate of some ten miles an hour, varying its direction according to the movements of the tides. So far as the foundations were concerned, work was possible only for a few hours at a time, and then only in calm weather. In the first season only seventeen landings were made and fifty-two hours spent on the rock; during the succeeding season the men landed fifty-nine times, putting in a total of 216 hours. To this dangerous rock 4,180 tons of masonry had to be transported, landed and fixed. When Captain Alexander, a noted American lighthouse builder, undertook to build a stone tower on Minot’s Ledge Rock, off Boston Harbour, for £60,000, he looked forward to reaping a rich reward for his labours. When the tower had been completed, Captain Alexander, though he was experienced in the difficulties of his task, found himself out of pocket. On his first visit to the reef it was so slippery with sea-moss, and the waves dashed over it so fiercely, that he could not maintain a footing. Part of the ledge was always covered with water, and the remainder, even at low tide, was never dry more than three or four hours at a time. On his return to shore, he sent a crew of men to the rock to scrape it clear of weeds and to cut level steps on which a firm footing could be maintained. They worked with desperation. When great waves came rolling in from the sea, the foreman shouted and they all fell on their faces, clinging together, and holding their breath until the rock was bare again. Sometimes, when a storm blew up suddenly and the boats dared not approach near enough to effect a landing, the boatswain would throw out a line, which one of the workmen would seize and make fast to his wrist before plunging into the sea. Then the sailors would drag him in. 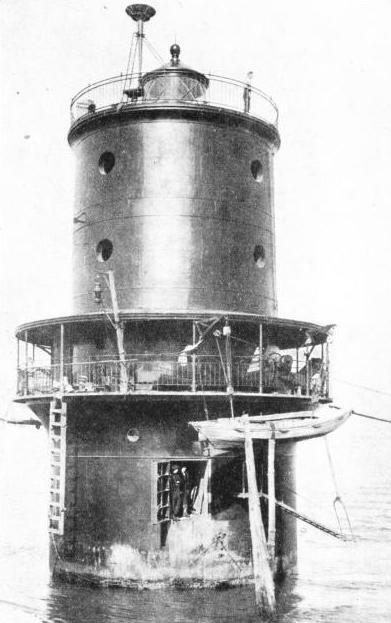 A CIRCULAR IRON STRUCTURE built in 1914 with a caisson foundation, the Thimble Shoal Lighthouse replaced a lightship in Chesapeake Bay, Virginia. American lighthouses are of many types, illustrating various methods of construction. Working in constant danger of their lives, and continually drenched and suffering from the smarting of salt-water sores, the brave men were able to cut only four or five holes during the whole of the first season. In the second year the workmen succeeded in building an iron platform 20 feet above low water level. The next winter a big coastwise barque, driven in a storm, swept away the platform and crushed the face of the rock, ruining two years’ hard work in a single night. In the third year the workmen succeeded in laying four foundation stones, and after this the work progressed fairly satisfactorily. In five years’ time the light was finished, “rising sheer out of the sea”, as the poet Longfellow described it, “like a huge stone cannon, mouth upward”. Even more terrible difficulties and dangers were encountered in building the Tillamook Lighthouse, off the coast of Oregon, USA. Tillamook is a small, abrupt rock formation, one mile from the mainland. Its sides are so precipitous and so inhospitable that even in calm weather landing is extremely dangerous. During the initial attempt to put a working party on the rock the foreman lost his life. The first thing the men had to do after they had effected a landing was to drive away a particularly vicious herd of sea-lions. A shelter, made of iron and wood, was then bolted to the rock. One night a tornado drove the seas entirely over the rock, crushing the shelter in which the men slept and washing away most of their provisions and nearly all their tools, clothing and equipment. For days at a time, in the coldest weather of a northern winter, the men were compelled to lie clinging to the slippery rock, drenched with icy water, buffeted by swiftly succeeding storms of snow and sleet, and lashed by the bitter sea winds. During all this time they had not sufficient means of warming themselves, scarcely any fresh water to drink, and nothing to eat but “hard tack” and bacon soaked in sea water. Few Arctic explorers ever had to suffer the perils and privations to which these lighthouse builders were subjected. Yet they contrived to build a great lighthouse on the summit of the rock. It has been said of the lighthouses of the United States that no two are alike, and there is certainly some truth in the statement. Along the Atlantic coast, and particularly down among the Florida reefs, there are wonderful structures built in the sea on what is termed the screw-pile principle. A light and the keepers’ quarters are carried on iron piles driven deeply into the bed of the ocean. Some of these piles extend to a depth of ten feet into living coral rocks. A temporary platform is built from which to conduct the operations, and steam tugs stand by to take off the workers when the weather turns black. Exciting rescues often take place, especially in those waters where gales rise suddenly. Ice is another enemy which the lighthouse engineer is always fighting. In one winter three lighthouses in Chesapeake Bay - Wolf Trap, Smith’s Point and Solomon’s Lamp - were swept away by the ice. Most of the lighthouses on the Great Lakes are closed during the winter months, when general navigation ceases on those waters. There is risk to men and vessels in taking off the keepers in the winter gales at the close of navigation. The beacons of the Great Lakes rise from dangerous rocks which are not only exposed to the full force of the waves and wind, but are also subject to severe ice pressure. For this reason the engineers have to build specially massive concrete bases. When the keepers returned to one of the lighthouses one spring, they found the ice piled up against it to a height of 30 feet. As this was 7 feet above the doorway they had to cut a passage-way through the ice to gain entrance to the tower. ONE OF THE ELECTRIC GENERATORS which supply current to the Lizard Light, Cornwall. The light is one of the most powerful in the world and has a strength of 3,000,000 candle-power, normally visible for 17 miles. Perhaps it is in the building of towers on sandbanks and on shifting shoals that the lighthouse engineer touches the pinnacle of his art. At the mouths of many rivers there are dangerous shoals, and, necessary as it is to light these spots by a fixed stationary light, such a feat was deemed impossible in the 1880’s. The German sea builders showed that it could be done by building a lighthouse upon a shifting shoal known as the Rotesand, near the mouth of the Weser River. Their plan was to sink a huge caisson upon the site, and to till it with concrete. Upon this more stable foundation a stone tower was built. Considerable difficulty was experienced in towing the caisson to the site and in sinking it. During the night after the caisson had been sunk, the workmen left upon it had an anxious time. Their novel home suddenly began to move and to heel over. The list grew more pronounced as the hours went by, so that the men could not keep their feet, and were forced to cling to the elevated end of the structure. Every moment they expected the caisson to throw them into the sea. At dawn, however, they were rescued from their perilous position. After many weary months of toil, when it began to look as if the efforts of the builders would be crowned with success, a terrible gale arose. The men were hastily got off to the mainland, but when they looked across the ocean next morning they could see no sign of the caisson, which had disappeared beneath the waves. The second attempt, however, was successful, though it often seemed that the sea would again rob them of victory. The second caisson measured 46 feet by 36 feet, and was more than 60 feet high when launched. Its shell alone weighed 245 tons, and with the various accessories on board the weight was brought up to some 335 tons. It was taken out to the site in charge of five tugs, but a sudden thunderstorm arose, and the unwieldy structure broke loose and was washed ashore. At last, however, after many delays, it was pulled and pushed, nudged and coaxed to the proper spot. Here it was sunk, the water was pumped out, and the men, descending into the lower chamber, removed the sand to allow the edge to sink deeper and deeper into the bank. After twelve months the bottom of the caisson was buried 73 feet below low-water mark, and its weight increased to some 4,350 tons. Then, to prevent erosion, huge mattresses of brushwood were sunk round the base of the tower and held down by boatloads of broken stone. For this protective work alone over 176,000 cubic feet of brushwood and 600 tons of blockstone were requisitioned. As the tower rises 75 feet above the top of the caisson, there is as much below the surface as there is above. Since then other shifting sandbanks in various parts of the world, which were a menace to shipping, have been crowned with a light. Their building demanded all the resource, pluck and ingenuity of the engineers. Although the tower probably creates the deepest impression upon the popular mind, because of the difficulties associated with its building, it is the light which is the vital thing to the navigator. To-day, the light may be provided by oil, gas, or electricity. The oil lamp has undergone a remarkable development. Sperm oil from the whale was first used, but later was replaced by vegetable oils and finally by petroleum. For many years flat-wick burners were exclusively used, and the efficiency of the oil lamp scarcely improved at all. Then came the circular wick with a central draught, followed by multiple-wick burners, and finally by the incandescent mantle. E lectric light was first used in 1859 at the South Foreland Lighthouse on the coast of Kent, but it has not come into extensive use in British lighthouses. 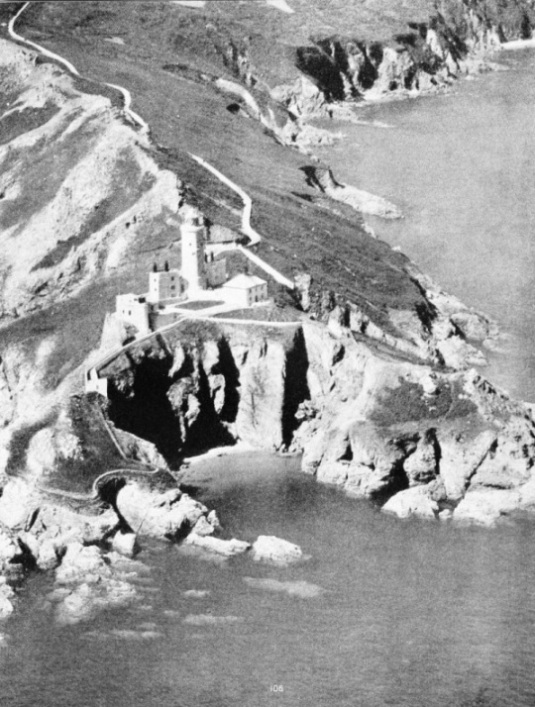 The most notable British electric beacons are at St. Catherine’s, in the Isle of Wight (about 3,000,000 candle-power); at the Lizard, in Cornwall (3,000,000 candle-power); and at May Island, off the Fifeshire coast (1,250,000 candle-power). One of the most powerful electric beacons is that on Heligoland, of 38,000,000 candle-power. 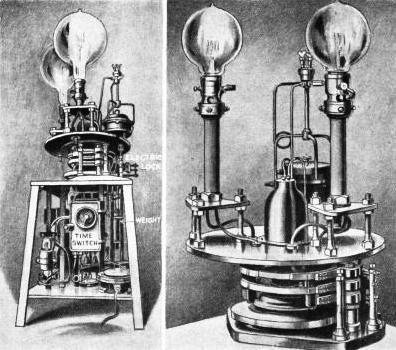 Formerly electric lighthouses used arc lamps, but these are now superseded by gas-filled filament, lamps of high power. THE ROTESAND LIGHTHOUSE is built on a shifting shoal in the estuary of the River Weser, Germany. Great difficulty was experienced by the builders of this tower. A caisson over 60 feet high was sunk to form a foundation. 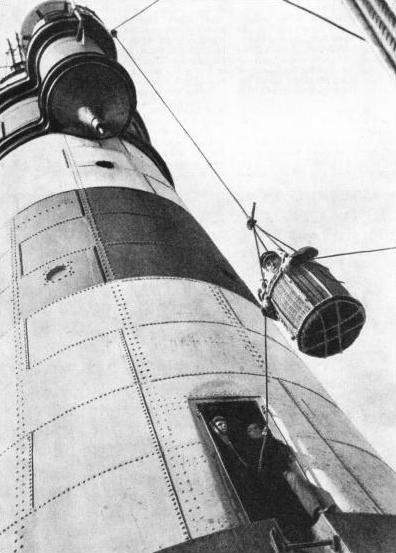 Four men operate the light, and they are lowered down to the relief ship in a basket. With the increased power of the light came the development of the optical apparatus, by which the light could be concentrated into one continuous beam or ray. At first ordinary reflectors were used. Highly polished surfaces were placed behind the illuminant. Then came the parabolic or cone-shaped reflector, fashioned of silvered glass, known as the “catoptric” system. It held the field until the invention of the “dioptric” reflector in 1811 by a celebrated French scientist, Augustin Fresnel. He improved upon existing reflectors by using glass prisms, concentrating all the rays of light into a horizontal beam. Although Fresnel completely revolutionized the science of lighthouse optics, his invention was developed and perfected by many later investigators. Among them were Thomas Stevenson, who brought about a whole series of all-round improvements; James Chance, who designed the dioptric mirror now in use and perfected the making of lenses; and John Hopkinson, who introduced group-flashing lights. With its complicated arrangement of reflectors, prisms and lenses, the light is encased in what is nothing more than a great glass-house, the lantern often weighing many tons. To produce a flashing light it is necessary for the apparatus to revolve, and this is accomplished by clockwork machinery. Formerly the table on which the lantern rests revolved on metal rollers; now it floats on mercury in a trough, so that friction is reduced to a minimum and much greater speeds of revolution may be attained. The clockwork machinery used for operating the lantern is driven either by weights or by springs, and has to be wound up at regular intervals. If the light used is electricity, the rewinding is often done by small electric motors which automatically wind up the machinery at the proper time. When gas or oil is the illuminant the rewinding has to be done by hand. So that the clockwork shall not be allowed to run down, a bell automatically rings as the time approaches for rewinding, thus warning the keeper on duty that the machinery requires his attention. 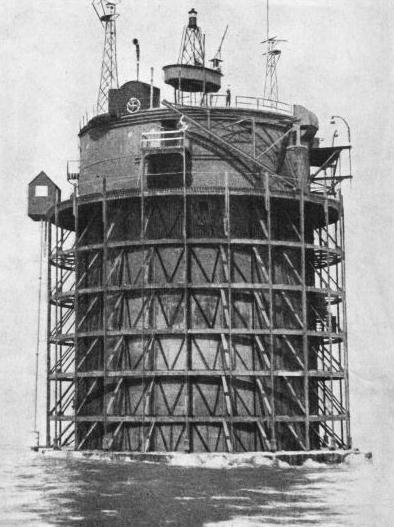 THE NAB TOWER was originally one of the “mystery towers” built at Shoreham-by-Sea, Sussex, during the war of 1914-18. It now serves as a lighthouse off the Isle of Wight. The light is of 12,000 candle-power and flashes for one second in every ten. An auxiliary light is also provided, as well as a fog reed horn. However powerful the beam from a lighthouse may be, it is of little use in thick fog. 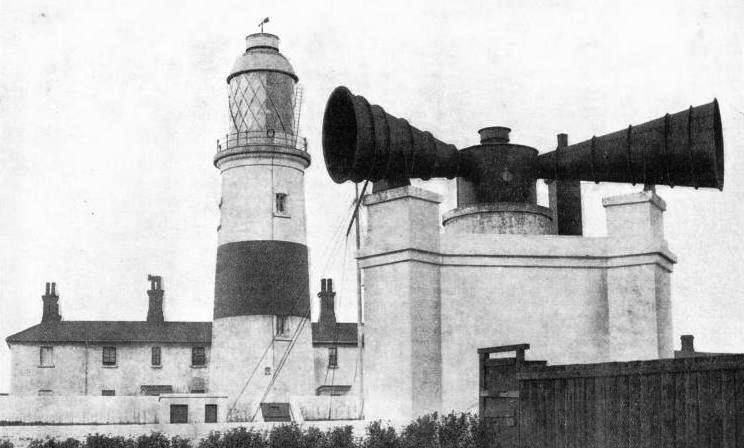 Lighthouses must therefore be provided with a means of sound signalling. Since the middle of the last century all kinds of sound devices have been tried for this purpose, and to-day we have the foghorn, the siren and the diaphone, all operated by compressed air. The foghorn is a large trumpet, in the throat of which is a thin tongue of metal fixed at one end only. Compressed air passing through the trumpet sets the tongue vibrating rapidly and produces the requisite sound. In the siren, which also has a large trumpet, the sound is produced by two slotted metal disks and, according to the speed at which they are made to rotate, a high or a low note can be produced. The diaphone consists of a cylinder with parallel slots in its walls and a piston with similar slots working inside it. The piston is driven rapidly backward and forward by compressed air, which escapes in a series of puffs through the slots. The diaphone gives a pure, low note, ending in a short descending note, known as the “grunt”. It is the most powerful of the fog-signals. Many lighthouses are equipped with wireless to enable them to report passing ships. The latest development in radio, as applied to lighthouses, is the beacon system, by which a mariner can know his position when thick fog and storm obliterate the light and the sound of the fog-signal. The device is being installed in the more important lighthouses of Great Britain, as well as in those of America and other lands. Above the pilot house of a modern liner is a small rotating loop aerial mounted on a metal frame. This coil receives the radio signals sent out by the lighthouse up to distances of a hundred miles or more. As the navigator approaches the coast he picks up the signal and by his radio compass determines the direction from which the signal comes. All types of craft, including fishing boats, are being equipped with radio direction finders.